Do you want to do what you love? Are you ready to deepen your yoga practice? Learn how to teach yoga and share your passion for yoga? 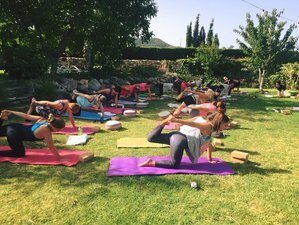 Join our 200-hour Viva La Vida yoga teacher training program in Andalusia, Spain from Friday, 12th of October until Friday, 2nd of November 2018. The training will be held in a small group of people with limited availability. We would love to welcome you in Cortijo Las Monjas. This old cortijo (farm estate) is situated between Periana and Alfarnatejo in the north-east of Málaga Province. The cortijo is about 600 meters above sea level. Enjoy outstanding views over the mountains and valley below, this lovingly restored country estate is the ideal place for a yoga teacher training course. Cortijo Las Monjas is a farmhouse. The farm and the outbuildings are over three hundred years old. The cortijo has been completely and sympathetically restored and divided up into really nice apartments and studios for two people to share with a bedroom with two twin beds, a bathroom, fully-equipped kitchen, and dining and living area with wood-burning fireplace, terrace, or porch. The cortijo has a really nice big pool that is open all year around. There is a beautiful garden with amazing views where will do part of our yoga sessions. The other sessions we will do in the beautiful recently built yoga shala of 100m2. The former stall has been transformed into this really amazing sacred yoga room with floor heating and high ceiling. Enjoy the beautiful countryside with its extraordinary beauty, and mild climate. Relax in the peaceful atmosphere, where you will be welcomed as one of the family. This three-week intensive yoga teacher training in Spain is a fully comprehensive, profoundly life transforming experience. The training is passionately, and skilfully, led by Ilse-Marie Sobering, Jane Bakx and Hannah Chapman, all experienced yoga teachers. The 200-hour Viva La Vida yoga training course is a professional, down to earth, comprehensive, well-organized, and highly effective program. For most people an intensive yoga teacher training is a profoundly transformational and life-affirming journey. We work with small groups with a maximum of 12-15 students. Therefore we can give personal attention to all our trainees. Each trainee has a personal mentor to guide them on their inward journey. There will be private sessions with your mentor weekly and whenever you feel you would like to have a talk. You can discuss any questions or doubts with your personal mentor. Our yoga teacher training program follows the standards of Yoga Alliance USA. This is an international body which sets international standards for yoga teacher training programs. Our 200-hour training program meets the required standards for a foundational 200 hours of study. Upon completion of this yoga teacher training, students will receive a certificate from our Registered Yoga School (RYS). Registration with Yoga Alliance provides a globally recognized credential. You may choose to register with them on qualification. Whether you register with Yoga Alliance or not you will still be the holder of an international certification to teach yoga. Our teacher training is an opportunity to transform how you relate to the world. For a lot of people, a yoga teacher training becomes a highlight in their life and an important turning point. Very often it is the beginning of a new life adventure. Immerse yourself in yoga study, find your path, and make friends for life. Sunrise yoga and meditation - You will wake up with a cup of tea and some fruit and enjoy the beautiful view over the mountains. We will start the day with a morning meditation. Afterward, we continue with an energetic Vinyasa practice. At 10 a.m. after breakfast, we dig deep into the training, learning about yoga philosophy, Ayurveda, anatomy, physiology, and more. At 2 p.m., after lunch, we will focus more on the practical teaching itself. You will get sessions on various yoga styles, how to teach, and on alignment. You will practice teaching in small groups. We will discuss the basics of teaching-learning about various poses, the muscles they open, breath work, and how to help students in and out of the pose. During the afternoon sessions, we will as well focus on the business aspect of yoga. With help of our teachers, you will create a plan for your yoga career. At 5:30 p.m., we wind down our day with a relaxed yoga practice, stretching into delicious Yin and Restorative poses. At 8 p.m. after dinner, it is time to relax and find your center in our daily meditation practice or a special workshop. Some nights we will have a movie night and show a nice documentary. This is an example of the daily schedule, please note times may change slightly. Students will learn postures and teach an asana practice, through a multitude of lectures, discussions, reading assignments, writing assignments, posture exploration, teaching exercises, posture sequencing, and class development. During the 200 hours 22 days immersion yoga teacher training we establish a steady rhythm of study, classes, practice, and rest over the course of the three weeks. The foundation course is designed to establish any serious practitioner and teacher in the principles and practices of yoga, Ayurveda, mindfulness, meditation, yang styles of yoga like Hatha yoga and Vinyasa and Yin yoga. Introduction to the anatomy of the human body as it relates to the asanas. Basic anatomy and physiology (with particular emphasis on respiration, circulation, and digestion). We have more than 20 years of experience in marketing and communications. We will have special working sessions on how to start your teaching career. You will go home with a plan and with useful advice on how to market yourself. We will discuss possible business opportunities and we will help you with ideas on how to create a website and how to use video, blogs, and social media. Furthermore we are offer the opportunity to gain work experience by helping with our courses and retreats. In the area, you can do beautiful hikes. Other activities that you can do in the area: visit some of the beautiful white villages, go to the natural springs, go to the Arabic baths, visit Malaga, go to the beach. You can book a really nice acupressure massage. There are only 14 places available.